Serbian playwright, producer, and festival director Jelena Kajgo (BITEF, Belgrade International Theatre Festival) joins us with director Ian Morgan (Associate Artistic Director, The New Group) to discuss contemporary Serbian theatre in a global context. Kajgo’s play Realists maps the shock waves of American-style capitalism and the global financial crisis 20 years after the fall of the Berlin Wall. The production, which is one of the first Serbian plays to be produced in New York by Americans, will receive its world premiere at HERE Arts Center under Ian Morgan’s direction. Join us for an evening featuring a excerpted reading from the play and a panel discussion featuring Jelena Kajgo, Ian Morgan, and Belgrade-born Ivan Talijancic of the New York-based multidisciplinary performance group Waxfactory. The Segal Center live streams its events. Check it out HERE ! Ian Morgan is the Associate Artistic Director of The New Group, where he has developed and directed new work, run the New Group (naked) second stage series, and curates the New Group/New Works play development program. For The New Group, he directed the Drama Desk-nominated The Accomplices by Bernard Weinraub, which went on to productions across the country, as well as Rich Boyfriend by Evan Smith, Critical Darling by Barry Levey and A Spalding Gray Matter by Michael Brandt. Also for Michael Brandt, he directed his play Missing Time (CSV) and workshopped Flood for Epic Theatre Ensemble. Other productions include Rough Sketch by Shawn Nacol (59E59); Ham Lake by Nat Bennett and Sam Rosen (Soho Playhouse); Sparrow by Linda Faigao-Hall (Theatre Row); and Progress by Matei Visniec (HERE). He has collaborated several times with playwright Brett Neveu, directing the world premieres of Ethnic Cleansing Day (The Production Company) and Eric Larue (HERE) – which was later produced at the Royal Shakespeare Company – as well as the New York premieres of Neveu’s Eagle Hills, Eagle Ridge, Eagle Landing and Twenty One. He has directed and workshopped new work at the Atlantic, the O’Neill, the Public, Rattlestick, New York Theater Workshop, New Dramatists, and Ensemble Studio Theatre. He directed a workshop production of Zohar Tirosh-Polk’s play Six for the Jewish Play Project, having developed it at Cape Cod Theatre Project and the Magic Theatre. In addition, Ian oversees and directs for The New Group’s “Life Stories” youth ensemble for New York City high school students. 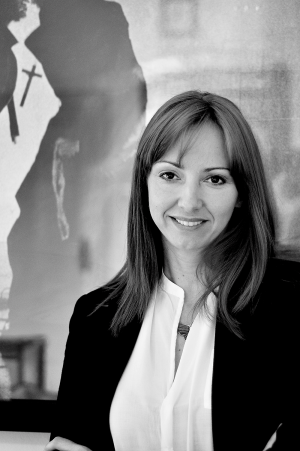 Jelena Kajgo is a playwright whose first play, Phantoms, was in the repertoire of the Theatre Atelje 212, Belgrade, and whose second play Intimate was in the repertoire of the National Theatre, Belgrade. Phantoms was also performed in Vienna in 2003, at the Schauspielhaus Theatre, and had public readings in Minsk (National Theatre), Leeds (West Yorkshire Playhouse), London (Gate Theatre), and Bucharest (Odeon Theatre). With Intimate, she attended the workshop held in the National Theatre Studio London in November 2003. In 2009, she became the Director of Bitef theatre, Bitef festival and Bitef Dance Company. Bitef theatre is an avant-garde theatre situated within a picturesque interior of a restructured Evangelistic church in the centre of Belgrade, whose goal is to discover new theatre trends in Serbia, and in providing space for the artists who break traditional forms of artistic expression. Bitef Dance company is the only professional dance company in Serbia, working within the Bitef Theatre. Jelena Stupljanin (co-adapter, performer) was born and raised in Belgrade, Serbia where she graduated from the Faculty of Dramatic Arts with BA in Acting and the award for the Best student of the spoken word that year. Right after her graduation, she got the lead part in a musical ‘Front Page Doll’ that toured many European countries and that got her the award for the Best actress from Theater ‘Terazije’. In 2001, Jelena became a permanent member of one of the leading Serbian theater companies “Atelje 212”, where she took part in many mainstream productions such as Bash by Neil Labute, King Lear, dir. Tomi Janezic, First Love by Samuel Beckett, Leda by Miroslav Krleza, Alice by Biljana Srbljanovic, and many more. With ‘Atelje 212’ she toured on stages of many European theaters in Sweden, Greece, Austria, Slovenia, Bosnia, Croatia, Bulgaria and Russia as well. Jelena performed with other theater companies in Belgrade as well such as: Yugoslav Drama Theater, Musical Theater ‘Terazije’, National theater of Serbia, and others. In 2005, with the support of HRH Princess Elizabeth Karageorgevic of Serbia and Ms Eileen Murray, Jelena was sponsored to attend the Lee Strasberg Theater & Film Institute in New York City. Beginning in 2010, she became a member of New York Innovative Theater Award-winning theater company Rising Phoenix Repertory. Recent New York theater credits: Much Ado About Nothing (dir. Daniel Talbott, Boomerang Theater co), And then it rained (dir. Ian Morgan, Downtown Urban arts),Woman Bomb (solo piece written by Allan Graubard, awarded Best Actress at the United Solo Festival in 2010), Stray Dog (dir. Julie Kline, Rising Phoenix Rep CINO nights), Graceful Living (dir. Holli Harms, EST), Sandbox (dir. Piotr Kruszczynski, 59E59 Theaters), Marko the Prince (dir. Marcy Arlin, Barrow Group theater), Progress (dir. Ian Morgan) and Heresy (dir. Marcy Arlin) both for ITP at HERE, Wellspring (dir. Elyse Singer, Hourglass group), Retzach (at 59E59 Theaters), and other projects. Her film work includes a lead role in the Oscar winning director Danis Tanovic’s award-winning Bosnian film Cirkus Columbia, and she was recently awarded the Best Actress at the Alexandria Film festival in Egypt for the role in that film. Other Film/ TV work includes The Ambulance; Jelena, Katarina, Marija; Fall into Paradise; Foxes (TV series), and others. Playwrights Writing for Television: Success or Compromise?